Read about Shawn Saunders’ Sourdough Boulangerie specialty einkorn and emmer breads, “hearty in bite and flavor” and “fantastic with an extra sprinkle of seal salt and thick spread of Kerrygold butter…” healthful, highly digestible sourdoughs that are “properly fermented for 24 hours to create a balanced, ‘nice, smooth sour, not an overly tart flavor’ …” by CLICKING HERE. Read Mike Callicrate describe the challenges and opportunities of the local food business in Company Week‘s overview of Ranch Foods Direct and Peak to Plains Food Distributing, CLICK HERE. For the latest sales promotions offered daily at the store, CLICK HERE. Coming soon… the new and improved Ranch Foods Direct at 1228 E. Fillmore… scheduled to open by mid-February! 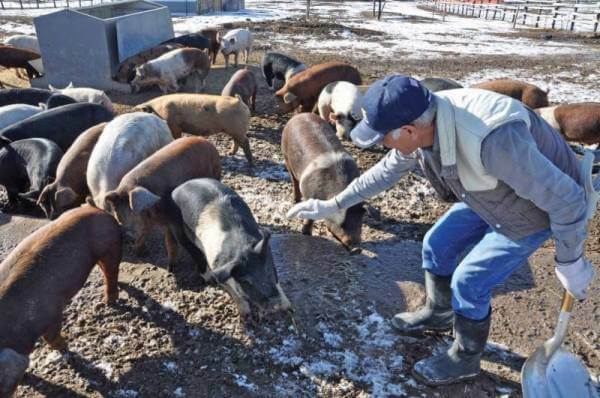 Above, Roberto reaches out to pet his favorite pig while helping with the winter feeding at Callicrate Cattle Co.